BOOK Tour/New York Times Media Decoder, June 25, 2010. Kimpton Hotel’s sponsorship of Alphabet City Book Tour! BOOK Tour/Lubbock Avalanche-Journal, August 12, 2010. Buchmeyer makes Lubbock stop on book tour—straight women biggest buyer of book. BOOK Tour/Lubbock Avalanche-Journal, August 9, 2010. A gay Mary Tyler Moore comes riding into town. BOOK Press/Dallas Voice, June 17, 2010. JP wants to turn the world on with his smile! BOOK Press/Gay.com—Hot Reads, June 9, 2010. He Made It After All! Q&A with Jon Paul on the site where he met Chef! BOOK Press/TV: Good Morning Texas May 17, 2010. 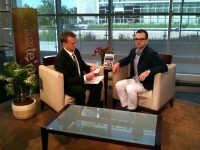 Celebrity Dish with Jon Paul live in hometown Big D on WFAA Channel 8. BLOG & BOOK Press/Manhattan Times, May 19, 2010. Story from ABCityblog about neighbor Fidel runs in Washington Heights’ newspaper. BOOK Tour/Bay Windows NE, May 19, 2010. Jon Paul appears in Boston at Kimpton’s Nine Zero Hotel. BOOK Tour/Florida Agenda, May 21, 2010. Jon Paul appears in Miami at EPIC Residences & Hotel and Bar 721. BOOK Tour/HotSpots! May 20, 2010. What’s Hot: Jon Paul swings through S. Florida revealing hilarious antics. BOOK Tour/Florida Chic, May 20, 2010. Jon Paul’s “art of storytelling” at EPIC Hotel. BOOK Tour/Midtown Chic-a, May 13, 2010. MIA Gets a Dose of Insider Celebrity Scoop from Acclaimed Author/Blogger. BOOK Press/Radio: Lambda Weekly May 16, 2010. Host David Taffet + team spend an hour getting the dish and behind-the-scenes stories. BOOK Tour/Dallas Morning News, May 16, 2010. Jon Paul Buchmeyer reading from Alphabet City as part of Dallas-area author tours. BOOK Q&A/EDGE: His Life As a Sit-Com May 12, 2010. Excerpt: “Buchmeyer’s uproarious and dishy account of his Big Apple rebirth.” Plus a great Q&A. BOOK Press/Dallas Observer: The Late Judge Buchmeyer’s Son Sends the World’s Greatest Press Release, April 22, 2010. Wow, high praise from my hometown! BOOK PRESS/Fox: Tyra Dislikes White Limos, Teddy Bears; Fox News National, March 1, 2010. At least they went to the blog and said some nice things about Whoopi, too! BOOK PRESS/NY Magazine: Do Not Give Tyra Olestra; New York Magazine’s Fashion Blog The Cut, March 1, 2010. BOOK PRESS/PageSix: Teddy Terror, New York Post PageSix, February 28, 2010. Most the most important gossip column around gives me another break! BOOK PRESS/Greenhill Alumni Newsletter: JP Buchmeyer ’87 Publishes new Memoir, April 2010. Distributed to 1700 alumnae—nice audience for a shout out to my sponsors Kimpton Hotels & Restaurants and National Gay and Lesbian Task Force! A Writer and Chef’s Brownstone in Washington Heights, FromMe-ToYou, April 14, 2010. Photographer Jamie of FromMe-ToYou.Tumblr.com turns our home into a work of art. Four People, Four Floors, One Home, Manhattan Times, November 17, 2009. Washington Heights’ neighborhood newspaper of record takes an interest in my living arrangement. Fashion VIPs TX: NY, Brilliant, March 2005. This crazy Lone Star state magazine’s tagline is “Texas Style & Substance,” but this feature on Texas transplants living in the Big Apple seems like neither. How did Frida and I end up in it? And my name spelled wrong…but I LOVE the photo! PR Pros Start Up Communications & Management Company, BizBash, January 22, 2008. The picture accompanying this story about me and Susan starting our own company inspired us to join Weight Watchers. Join the Cooking Club! WABC 7 News, June 20, 2008. Our Tuesday night dinner supporting our local CSA gets a little airtime thanks to Susan’s efforts on behalf of Bon Appétit. I don’t think the video clip works any longer, but you can read the story. In the Heights: Vitality & Diversity at Manhattan’s Tip, Gotham Gazette, June 23, 2008. On my 3rd trip to see the musical that made the ‘hood famous, we bumped into a reporter who wanted to see if the area was really like the show. Next thing I know, she’s at my Easter table! Tony Landslide: ‘Cry Baby’ By 1, Michael Reidel’s column in the New York Post, May 16, 2008. You know you’re a theatre queen when you show up as a bold-faced name in Michael’s column! Accounts of Note, New York Times, October 1, 2007. A little note about the opening of Tentpole NY! Pet Benefits, Crain’s NY Business, November 18, 2007. Frida goes to Tentpole!